Alcohol free toner for all skin types, with the heavenly scent of orange flower. Orange flower water is well known for its regenerating and healing properties and is often used an an anti ageing ingredient. This organic toner will remove the last traces of cleanser without stripping your skin and is ideal as a freshening pick me up if your skin needs a boost. Perfect to cool down hot holiday skin too. 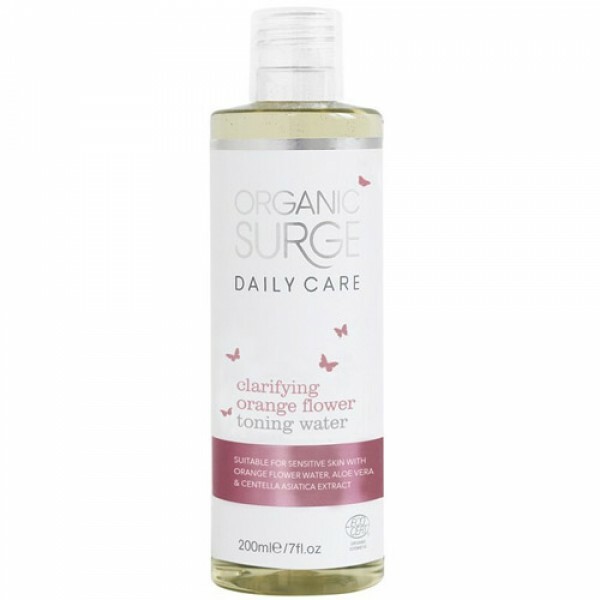 This toner is perfect for refreshing my face after using the Organic Surge daily cleanser. It smells fresh and leaves my skin feeling wide awake! Aqua/Water, Aloe Barbadensis Leaf Extract*, Citrus Aurantium Amara Flower Water*, Centella Asiatica Flower/Leaf/Stem Extract*, Benzyl Alcohol, Dehydroacetic Acid, Potassium Sorbate, Sodium Benzoate, Sodium Phytate, Citric Acid. *ingredient from organic farming. Free from animal-derived ingredients. Suitable for vegetarians and vegans. Product colour or texture may vary slightly due to natural ingredients. Store in a cool dry place, out of direct sunlight. Apply with a cotton wool pad or tissue, sweeping gently over your skin after cleansing. Use morning and night, avoiding direct contact with eyes. Follow with your favourite moisturiser.